The new edition of WinX DVD Ripper Platinum has been released, and it’s the fastest version of this widely-known DVD ripping software ever. Amongst many improvements, the speed of DVD to MP4 conversion has been increased to an impressive new milestone. While many of us are familiar with DVD ripping tools, we’ve often had bad experiences in the past, as despite the promises of their creators, DVD ripping speed and quality often turned out to be nothing but promotional slogans. This led to poor image quality and long rip times, with converting a DVD to MP4 taking almost an hour in some cases – which isn’t great if you have a huge DVD collection! WinX DVD Ripper Platinum is set to change all that by providing incredibly fast ripping speeds thank to its unique kernel, along with a Super Encode Engine and Hyper-threading technology to make the most of your PC’s hardware. This application uniquely utilizes level-3 hardware acceleration to make use of your PC’s multi-core processor and powerful graphics card, especially with Intel QSV and NVIDIA NVENC techniques. By fully utilizing such tech, WinX DVD Ripper Platinum reaches incredible DVD ripping speeds that puts its competitors to shame, especially when performing DVD to MP4 conversions. You can also guarantee your ripped DVDs look their best, as WinX DVD Ripper Platinum is the only DVD ripper that replicates your DVDs without a single dropped frame. To see just how easy it is to use WinX DVD Ripper Platinum, check out this guide on DVD to MP4 converting. We’ve also included a step-by-step guide below showing you how you can get the fastest ever DVD ripping speeds with WinX DVD Ripper Platinum. You can also choose 'ISO image' or 'Folder' at the top of the screen. A window will pop up asking you to select your DVD drive. Do so, then click ‘OK’. Once WinX DVD Ripper Platinum has loaded your DVD you can now choose your target output format. Not just MP4, it is also extremely fast at converting DVD to a huge range of file formats like AVI, H.264, MPEG, WMV, MOV, and M2TS files, etc. So no matter what device you want to play your video files on, you’ll be able to create a compatible file.Once WinX DVD Ripper Platinum has loaded your DVD you can now choose your target output format. Not just MP4, it is also extremely fast at ripping DVD to a huge range of file formats like AVI, H.264, MPEG, WMV, MOV, and M2TS files, etc. So no matter what device you want to play your video files on, you’ll be able to create a compatible file. Once you’re happy with your settings, just click on the big ‘Run’ button and WinX DVD Ripper Platinum will begin converting your DVD to MP4 at 300 - 500 FPS ! It really is that simple. To get the fastest possible DVD ripping speeds when using WinX DVD Ripper Platinum, make sure you select the correct hardware encoders – this means WinX DVD Ripper Platinum can take full advantage of the power of your PC to reach extreme DVD conversion speed. So just how fast is WinX DVD Ripper Platinum? The DVD ripping speed of WinX already outperformed common DVD rippers thanks to its full utilization of the Super Encode Engine, Hyper-threading and multi-core (up to 8) CPU utilization, and now it is making the best of hardware acceleration tech to perfect its transcoding engine. 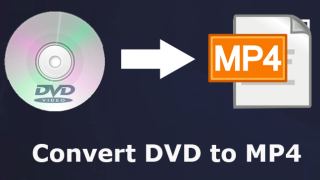 You can convert a DVD to MP4 (as well as many other file formats such as H.264, AVI, MPEG, WMV, MOV, and M2TS) using a standard DVD drive in under five minutes! It’s also incredibly easy to get ripping, thanks to over 320 built-in video and audio codecs that ensure compatibility. There are also a huge number of profiles for making sure you rip your DVD to a file type that’s appropriate for your devices such as the latest iPhone, iPad, Android, and much more! WinX DVD Ripper Platinum also provide four DVD backup modes that give you complete control over backing up your DVDs. You can make an exact 1:1 clone of the DVD to an ISO image or a folder on your PC. You can also choose ‘Main Title Content Copy’, which you copy and save selected Audio, Video and Subtitle track to hard drive. Meanwhile, performing a full title copy will back up all the audio tracks, video chapters and subtitles on a DVD. You can also tweak the settings to edit what parts of the DVD is backed up as well. No matter what sort of DVD you need to back up, be it a home-made DVD, music DVD, or professional DVD, WinX DVD Ripper Platinum is the only DVD ripping software you’ll need. It’s even robust enough to read and rip damaged DVDs and bring those unplayable discs back from the dead! This is great news if you have lots of precious and irreplaceable home videos and photos stored on ageing DVDs. Thanks to WinX DVD Ripper Platinum, you can quickly back them up and store them safely for complete peace of mind. Make sure you give WinX DVD Ripper Platinum a spin yourself to see just how fast – and powerful – it is, as there’s a chance for you to try it out for free. Though the DVD industry is declining, Digiarty is dedicated to providing fast and easy-to-use DVD related software for Windows and Mac users for over 10 years. Digiarty's DVD related software is continuously updated to support the latest protected or to better restore old scratched DVDs, and to cover newly released formats and devices. Beyond its DVD converter software, the company also produces a H.265/HEVC video converter, an online video downloader, 4K video compressor, media players, an iPhone file manager, and a video audio streaming app.